"Madame made a start - about sonnets, - I encouraged her a little - made a provoking remark - and yes! There was the discharge. A heavy thunderstorm - Clearly he had been brooding on it for a long time and had intended to burst on this day. [...] Kloos’ verses ridiculous - Persefone mediocre, a repetition of Keats’ Endymion - Johannes’ grog of Woutertje - one did not write proper Dutch anymore - astray! sadly astray! - you all will come to regret it - and then bang! a blow on the table." An awkward silence followed. Van Eeden peeled a pear, looked out the window and remarked it was good living on the Esplanade, "as good as in the countryside.” Anne agreed and the remainder of the conservation progressed smoothly; gradually also Huet came round. They drank a glass of brandy and Van Eeden was invited to accompany him into his study to smoke a cigar. There they talked about Scandinavian, German and French literature and it was all 'dear friend' and 'dear van Eeden’ again. He had to promise to return on the following Sunday. This did not change Huets opinion about De Nieuwe Gids though. The second issue also could not find his approval. He failed to understand, Anne later wrote to Van Eeden, that "the same young man who had been sitting at his table, had written that piece [the episode of De Kleine Johannes in this issue]." But his criticism did not affect their relationship. 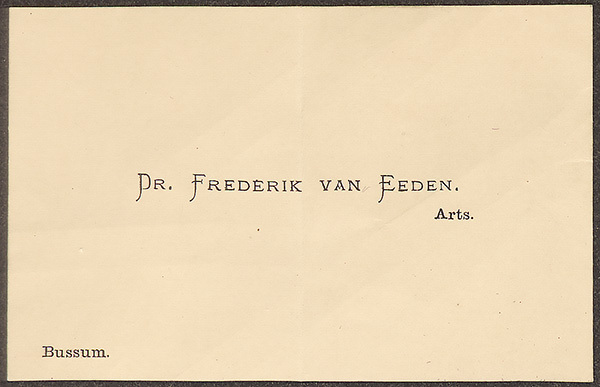 When Van Eeden was promoted a year later and settled in Bussum as a physician, he must have sent them this very card. Post by Olf Praamstra, Extraordinary Professor of Dutch literature in contact with other cultures, Leiden University.